The Chillton Hostel offers budget accommodation with great facilities, including a large common room with free internet, Wi-Fi, satellite TV, music etc, plus a guest kitchen with everything you need in it, including free coffee and tea all day. Each of our guests is offered a free welcome drink of traditional Serbian Sljivovica! All rooms have air conditioning. We have rooms with two, three, four, six and 10 beds; rates include linen, towels, lockers and taxes. We rent some of our rooms with four or six beds as a twin or single, etc. Maximum rooms that anyone can book is three. If you stay more than three nights you'll get one free load of laundry! We have 24 hour reception with a wake-up service, city maps, scanning, printing and faxing services, travel info and much more. If you're arriving at the airport, we offer a pick-up service for only â‚¬12. To make sure you can get a seat, it's best to book at least one day in advance. We can assure you that you will enjoy your stay with us and we look forward to welcoming you to our property. We're happy to assist you with all your travel needs. 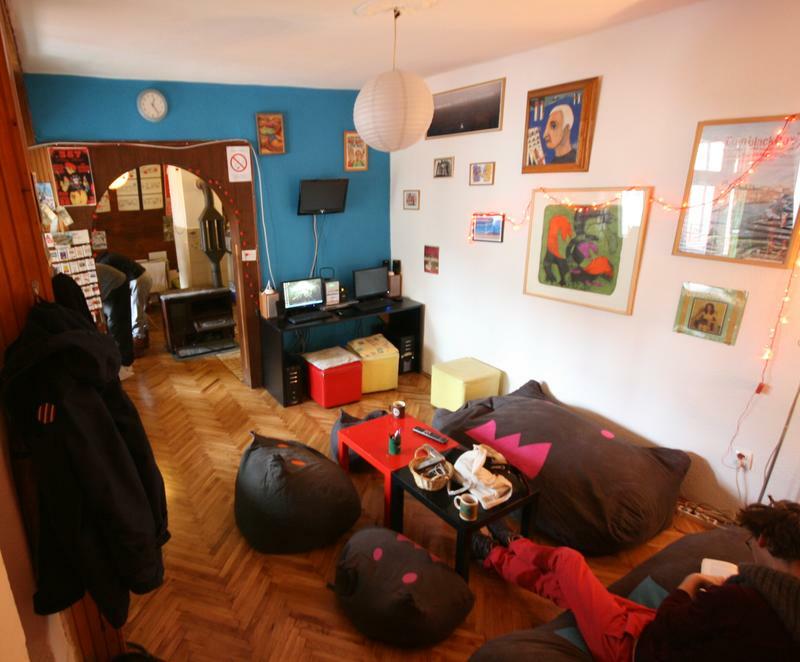 Not all hostels in Belgrade include the city tax of â‚¬1.32 in their rates, but we do! Take a bus 83 (direction up the big boulevard Nemanjina/ÐÐµÐ¼Ð°ÑšÐ¸Ð½Ð° you see in front of the railway station) and get off one stop after the Slavija-Ð¡Ð»Ð°Ð²Ð¸Ñ˜Ð° square (3 stops from the railway station, 4 stops from bus arrivals), go back couple of meters and you are in Kataniceva-ÐšÐ°Ñ‚Ð°Ð½Ð¸Ñ›ÐµÐ²Ð° Street. Look for number 7. In a mood for a walk? Easy, just take Nemanjina/ÐÐµÐ¼Ð°ÑšÐ¸Ð½Ð° street up all the way until Slavija square (approx. 1000m), than take Svetog Save/Ð¡Ð²ÐµÑ‚Ð¾Ð³ Ð¡Ð°Ð²Ðµ street, walk up to Hram Sv.Save (huge white temple, approx 400m from Slavija square), then turn left. You are in Kataniceva/ÐšÐ°Ñ‚Ð°Ð½Ð¸Ñ›ÐµÐ²Ð° Street! Look for number 7. Taxi should not cost you more then 250-300 din (â‚¬2.50 to â‚¬3). Don't take taxis waiting for you in front of the station - walk to the street and stop one there. Taxi drivers must put the meter 'on' and it must be on the position 1 (06-22h) or position 2 (22-06h and on Sundays and public holidays) - never on position 3! We offer a pick-up from airport for â‚¬12 (the price is per car, four persons max. in one car). To make sure you get one, the best is to book at least one day in advance. Just write us email or sms, we'll be glad to book one for you! This option will take from 30 minutes. Or, take a mini bus A1 (ticket approx. â‚¬2.50) that goes to Slavija square (final stop). Take Sv. Save street / Ð£Ð»Ð¸Ñ†Ð° Ð¡Ð²ÐµÑ‚Ð¾Ð³ Ð¡Ð°Ð²Ðµ (small street that goes between Slavija hotel and Slavija Lux hotel) and walk to the Hram Sv.Save (St.Sava temple), turn left to KataniÄ‡eva / ÐšÐ°Ñ‚Ð°Ð½Ð¸Ñ›ÐµÐ²Ð° str. Look for number 7. Or, take a bus 72 (ticket approx. â‚¬1) that goes to Zeleni Venac bus stop (final stop), walk uphill with Prizrenska / ÐŸÑ€Ð¸Ð·Ñ€ÐµÐ½ÑÐºÐ° str. (need a break? great ice cream in this street) to Moskva hotel and there take any trolley bus (19,21,22,29) and get out on 3rd stop (one stop after the round Slavija square). Walk back couple of meters and you are in KataniÄ‡eva / ÐšÐ°Ñ‚Ð°Ð½Ð¸Ñ›ÐµÐ²Ð° str. Look for number 7. Price of the taxi in front of the airport is a matter of agreement with the driver, should be â‚¬15 but it can be up to â‚¬40.